A rendition of Port Zante’s second pier with three Oasis Class vessels simultaneously. 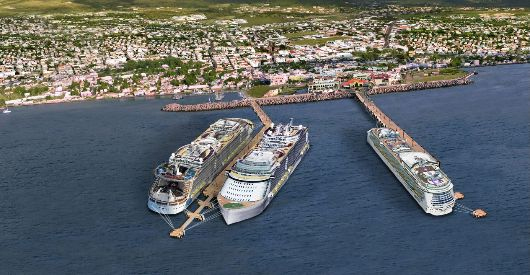 BASSETERRE, St. Kitts — When completed, the second cruise pier at Port Zante will accommodate three Oasis Class vessels simultaneously. This is by no means a small feat, according to Minister of Public Infrastructure, the Honourable Ian Patches Liburd, adding that local contractors have benefited greatly from the project. Minister Liburd said that one of the mandates of the Cabinet for the project is to, as much as possible, source material and local labour. “I can report to this Honourable House and to the nation that we have done that,” said the minister. He further reported that one of the local contractors, Kelly Construction, is making all precast slabs and beams. To date, they have procured 2,000 cubic yards of concrete, which is being supplied by TDC Group of Companies Ltd.
“The project I’m advised is expected to consume some 9,000 cubic yards of concrete all of which will be supplied by St. Kitts Masonry Products,” said the minister, adding that to date the contractor has procured some 200 tons of steel that are being utilized in the project. The steel was also supplied by TDC. One thousand tonnes of steel will be used in the project, reported the minister. Over 90 percent of the steel is already at the site. TDC has supplied 55 percent. Minister Liburd stated that these materials will not be imported. “As a matter of fact, as the minister with responsibility for the quarry, I am advocating that they bring the quarry up to a state of efficiency and effectiveness that we will start to export material from the quarry rather than importing,” he said. Approximately 100 persons have been employed for the construction of the second cruise pier at Port Zante, said Minister Liburd, highlighting that all welders at the site are local welders procured by the main contractor American Bridge. All timber, fuel and other consumables are locally sourced, he said. The timber has been provided by TDC and fuel from Sol. The pier lighting will be procured and installed locally by Kelly Construction. Approximately $400,000 to $500,000 are being spent monthly on procurement of supplies locally. Construction on the second cruise pier, which is financed under a syndicate arrangement between the St. Kitts-Nevis-Anguilla National Bank (SKNANB); the St. Kitts and Nevis Social Security Board; the St. Kitts and Nevis Sugar Industry Diversification Foundation (SIDF) and the St. Kitts and Nevis Trading and Development Company (TDC), is expected to be completed in September.